When I visited Columbus, Ohio for the first time in 2009, I started my culinary excavation at a locally-recommended diner called Cap City. On the outside, it looked like a very traditional run-of-the-mill diner you’d see anywhere. On the inside, it was like being transported to a chic European bistro. 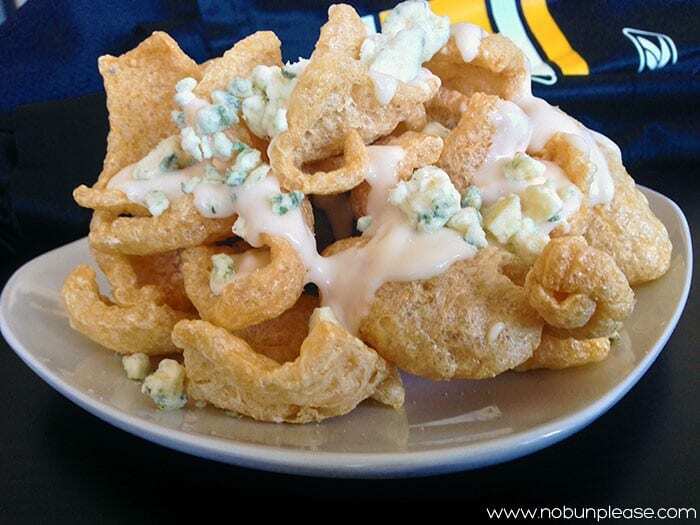 Already intrigued by the surprising interior, I scoured the menu and came a cross a very interesting appetizer consisting of potato chips, Maytag blue cheese, alfredo sauce and scallions. Needless to say, I was confused, but my curiosity was piqued. The waiter brought out what seemed to be a mountain of crispy potato chips drizzled with a creamy alfredo sauce, and topped with the pungent Maytag blue cheese. It was heaven. It was slightly warm and packed a great crunch. I was immediately hooked. Now that potatoes are essentially a no-no on a ketogenic diet, I had to find a different base to provide that familiar crunch and was also low carb. Enter pork rinds. To assemble, just pile a mound of pork rinds on a plate and drizzle with as much alfredo sauce as you’d like (it’s best warm, in my opinion). After, top with Maytag blue cheese (traditional, other brands would work). For a deeper depth of flavor, I drizzled a very tiny amount of white truffle oil over top. Be careful with truffle oil; a little goes a long way! I thought it might be a little silly to make a recipe out of this as it is mostly just assembly, so instead I decided to include a homemade alfredo recipe that is not only low-carb, but also gluten-free! I’m honestly not a fan of pork rinds by themselves, but when mixed with other things, I quite like them. Thanks to my Columbus experience and new lifestyle of eating, this is and will be a major favorite in my keto repertoire. Macro/Nutrition: For 1/6 of the Alfredo sauce recipe, this come out to roughly 280 calories, 2 carbs, 2 NET carbs, 27 grams of fat , 0 grams of fiber and 7 grams of protein per serving! Heat cream cheese on low until melted. Gradually add in heavy cream, continuously stirring. Once those are combined, add cheese and spices. If mixture is a little too thick, add water in small amounts to thin it out. Has a restaurant dish ever inspired one of your kitchen creations? Comment below! The recipe is for the alfredo sauce, you just pour it over the pork rinds and add the cheese after! 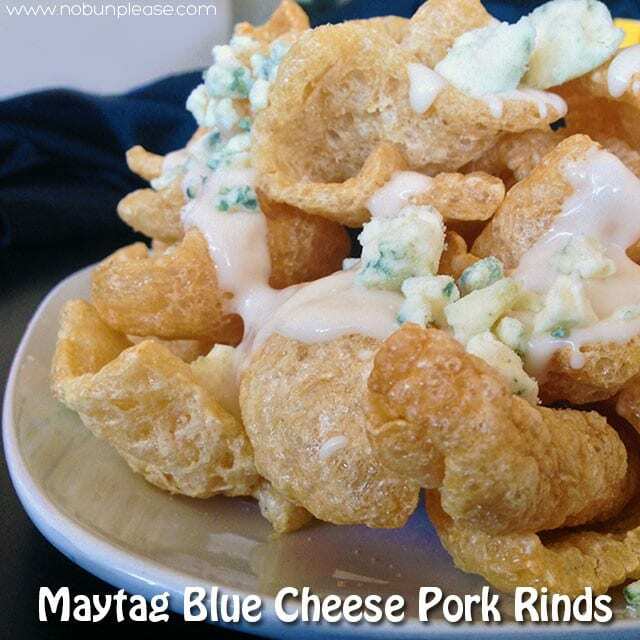 Although, I should look into making pork rinds — that could be a fun recipe! You said you’re not a fan of pork rinds. Have you ever had them fresh/home made? I thought pork rinds were nasty until a friend of mine made some at her home and they were Amazing! Prior to that I had only had the kind that come in a bag at the grocery store. I have actually grown to love them since I wrote this post, haha! I did have them fresh before and it was a total game changer. They brought them to our table warm and they were still crackling. So good!